It's not only a solution - it's a revolution! 4K UVX Ultraline Displayport 1.2 Extender over IP in copper with a range of 100m/328ft at a resolution of 4096x2160 @ 60Hz with perfect color coding at 4:4:4 @ 8 bit per color. The perfect tuning of kvm-tec video compression with a low latency allows a delay-free transmission of the signal. USB and video are transmitted with only one cable. 4K videos can be transmitted in real time. The CPU (local) and the CON (remote) part have two local video outputs, splitter function with 4K or Multi-stream support at a resolution up to 2560x1440, the built-in MST Hub/Splitter allows the transmission of two different image contents via one cable up to a maximum resolution of 2560x1440. 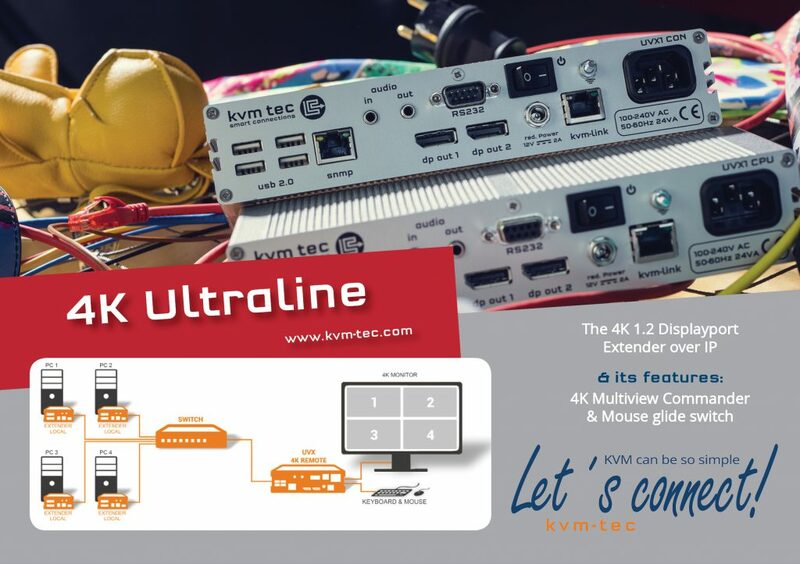 4k Multiview Commander- kvm-tec innovation. The contents of 4 different PCs can be operated and controlled on only one 4k monitor. As a stand-alone solution, up to 4 Full HD screen contents can be displayed and controlled on a 4k monitor. In the switching system, the 4k Multiview Commander can also be used here in conjunction with the Switching Manager tool. Up to a maximum of four 4k screens/16 different PCs with full HD output. Mouse Glide & Switch- Operated via the switching manager and with only one mouse and one keyboard with several PCs can be operated from one workstation. The arrangements of up to 8 monitors can be horizontal or vertical and are comparable to a virtual desktop wall and can be operated via the Switching Manager.